Even the largest hard drives will eventually fill up with data. If you can't afford to waste disk space, you can always turn to a specialized application to remove duplicate files that take up disk space needlessly. Duplicate removers are a-dime-a-dozen nowadays, but if you want to see something really interesting and unique, you should look at Abelssoft's FileFusion. On the surface, it doesn't look any different than what you're used to seeing in applications of this kind, but if you peek under its hood to see how it works, you will definitely want to keep it. Rather than deleting duplicate files and leave you to organize them in your folders, the software replaces them with hard links. In other words, all identical files will remain in their places, but only one of them will be the real one that actually uses disk space. This can be quite useful if, in fact, you need those duplicate files for one reason or another. 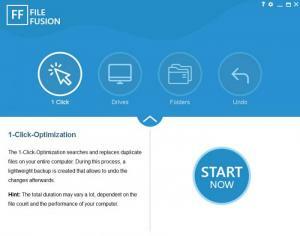 FileFusion is free to try for a limited time but without any kind of functionality restrictions. You can install it on any modern Windows system, without going through a complicated process. The software doesn't rely on any third-party tools or services, and it doesn't use a significant amount of resources. The software's user interface has a modern and elegant design, and its controls are laid out in an efficient manner. It provides you with options for clearing duplicates from one or more drives of your choice, from targeted folders, and for performing a one-click-optimization, which scans your entire system. The application uses advanced fingerprinting methods to identify duplicate files, so they will be marked as such even if they have different names. Just like a traditional duplicate cleaner, FileFusion lets you know how much memory you can save by clearing the identified duplicates and it lets you carry out the operation immediately, with a single click. The main difference is that you won't notice any differences in your files, but you will see more free disk space. Once a cleanup process is complete, you will still find all the targeted files in their original locations. However, only one of them is the real file that uses disk space, while its duplicates simply point the way to the original. You can be forgiven if you think that FileFusion didn't do a thing, especially if you look at a duplicate's properties, but the extra disk space that's made available certainly tells a different story. Safety is another one of FileFusion's advantages. All questions about the program's functionality and what will happen after a cleanup job can begin with "don't worry." For example, if you want to edit one of the duplicates, a copy will be created automatically, so you won't affect the original file. Furthermore, if you delete the original file, one of the hard links will become the new original, so you don't have to worry about losing the file. If you need the extra disk space, but you also need a few copies of the same file, FileFusion lets you have both at the same time. You can replace duplicate files with hard links to the original. You won't notice any differences in your files after a cleanup job, but you will notice more free disk space. Editing or deleting a duplicate or the original won't impact the other files. There are no obvious design flaws or functionality gaps to point out. You can download FileFusion free here.